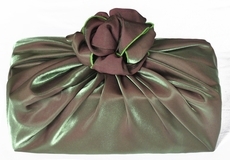 A warm silvery metallic wrap that reverses to a plummy gray. Size Medium, 27 x 27 in. Here's a variation on the Bow Tie wrap that provides a useful little pocket for a card. First, put your item or items in the center of a wrapping scarf on the diagonal. Fold 2 opposite corners on top or the item. Take the pointy corner on top and fold under to create a straight edge across the middle of the item. This is where you can tuck in your card later. Neatly bring up the remaining 2 corners and tie a snug square knot. As a finishing touch, I picked a sprig from my wonderfully fragrant mock orange bush to tuck into the gift alongside a card.